1913 - Ivar Kreuger formed Svenska Tändsticks Aktiebolaget, STAB (Swedish Match Company); lent over $300 million dollars to governments in Europe, Latin America, and Asia in exchange for national match monopolies; became world's largest match manufacturer; built small, family-owned match business into a $600 million global match empire; owned manufacturing operations in 36 countries, had monopolies in 16 countries, controlled 40% of the world's match production; relied on international capital markets to finance acquisitions and monopoly deals; 1929 - Kreuger company stocks and bonds were most widely held securities in United States and world; 1932 - Krueger died in Paris (suicide? ); forensic auditors discovered giant pyramid scheme; Kreuger accounts hid fictitious assets in maze of over 400 subsidiary companies; Swedish Match's deficits exceeded Sweden's national debt. August 13, 1920 - Thousands of investors demanded their money back from Carlo Ponzi. Anticipating the collapse, had already attempted to gamble with the $2 million in a vain attempt to make up the lost money. Ponzi went to jail and was deported to Italy in 1934. He told reporters, "I hope the world forgives me." 1919 - told friends and potential investors that they would get a 50 percent return on their money within 90 days if they invested with him. The hapless investors were never told much about what Ponzi planned on doing with their money, but, when pressed, he told them that it had to do with international postal exchange coupons, an obscure field that virtually no one knew much about. Paid off his initial investors and soon the investment dollars were pouring in. Thousands of people came to his offices, where money was stuffed in every desk drawer and filing cabinet. Ponzi was taking in an estimated $200,000 a day at the frenzy's peak. When a local writer questioned Ponzi's financial record, he threatened to sue and scared off further inquiry. When state investigators finally began examining his books and interviewing his workers they found that there was no real investment going on. Of course, only the very early investors actually got any money back, and these funds came from later investors. October 11, 1972 - Securities Exchange Commission (SEC) filed charges against Bank of America Vice President George L. Bates and Western Oil Development Corp.; charged Bates with "fraud and deceit" while trading stocks of Western Oil; accused Western Oil officials of using "fraudulent statements" to boost company's stock price (to use as resource to "acquire valuable properties"); SEC also convened hearings on charges of anti-fraud violations by Continental Investments and two of its subsidiaries; stemmed from charges that Continental Investment manipulated its investment relationship with the United Fund group, mutual fund company, for improper fiscal gain. Continental Investment officials maintained their innocence, described their dealings with United Fund group as "complex" and "technical," but not corrupt. August 24, 1982 - Era of unfettered greed on Wall Street in mid-1980s. Martin Siegel (mergers-and-acquisitions executive at Kidder, Peabody & Co.) met Ivan Boesky at Harvard Club in New York City; agreed to give inside information on upcoming mergers for pay; at end of 1982, Boesky delivered $150,000 in $100 bills to Siegel at Plaza Hotel; over next few years, Siegel passed inside information to Boesky on several occasions (Boesky made $28 million in Carnation stock before its takeover); Boesky's success fueled investigative inquiries (by both press, Securities and Exchange Commission), rumors about Siegel and Kidder, Peabody & Co.; January 1985 - Siegel demanded $400,000 (cash drop-off was made at phone booth), decided to end the illegal arrangement. October 1982 - Barry Minkow started small carpet cleaning business in mother's garage in Los Angeles suburb; expanded into insurance restoration company (damaged buildings); December 1986 - went public (clean audit opinions from two accounting firms, registration statement from large Wall Street firm); reached market capitalization of $280 million; youngest person to take company public in Wall Street history; June 1987 - fraud discovered - - no restoration projects, minimal revenues relative to reported sales, no profits; July 2, 1987 - Minkow (20) resigned; January 1988 - indicted on 54 counts of racketeering, securities fraud (valued at $26 million), embezzlement, mail fraud, tax evasion; convicted, sentenced to jail; April 1995 - released. May 2, 1985 - E. F. Hutton & Co. pleaded guilty to charges that it had engineered a massive check-writing swindle; lawyers admitted that the firm had managed to soak hefty sums of money from its various bank accounts without paying a cent of interest ( in the neighborhood of $4 billion in checks between the summer of 1980 and February 1982); consented to pay roughly $10 million (in fines) and restitution to the victimized banks; none of the roughly twenty-four employees involved in the swindle faced criminal charges. May 28, 1986 - The U.S. Court of Appeals upheld conviction of writer R. Foster Winans, author of the "Heard on the Street" column for the Wall Street Journal, for securities fraud; entered scheme with two brokers at Kidder Peabody to give them advance information about his column; brokers, Kenneth Felis and Peter Brant, made $700,000 by trading stocks that Winans touted in the newspaper; Winans and his lover, David Carpenter, received only $31,000 in kickbacks; case became public symbol of the widespread greed, corruption, win-at-all-costs mentality of Wall Street that prevailed in the 1980s. November 14, 1986 - Wall Street arbitrageur Ivan Boesky pleaded guilty to insider trading, agreed to pay $100 million fine, cooperate with Securities and Exchange Commission's investigation; SEC called it "Boesky Day," crucial in exposing a nationwide scandal at heart of `80s Wall Street boom; Boesky received three-year sentence, 22 months of which he served at Lompoc Federal Prison in California; Congress increased penalties for securities violations; Boesky demonized as national symbol of greed, example of dangers of `80s-era excess; Siegel one of few cooperative witnesses for government, virtually only one who showed remorse for his role in fraud, got 2-month sentence, large fine. November 15, 1986 - The SEC fined Ivan F. Boesky $100 million for insider stock trading. December 18, 1987 - Ivan F. Boesky sentenced to three years in prison for Wall Street's largest insider-trading scandal. served two years of his prison term, paid over $100 million in fines. October 22, 1988 - Congress passed bill designed to combat fiscal corruption; doubled maximum prison term for insider trading (toughest sentence = ten years in jail; raised ceiling on fines for insider trading up to $1 million for individuals, $2.5 million for corporations and partnerships; made companies responsible for improper trading committed by their employees. December 21, 1988 - Drexel Burnham Lambert Inc. pleaded guilty to charges of mail, wire, and securities fraud; agreed to hand over a record $650 million in fines, as well as to cooperate with authorities in their ongoing investigation of other Wall Street figures; provided evidence against Michael Milken, junk-bond king (indicted in 1990 on nearly one hundred counts of racketeering). February 13, 1990 - Drexel Burnham Lambert filed for bankruptcy. 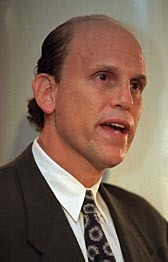 April 7, 1990 - Michael Milken pleaded innocent to security law violations; April 24, 1990 - pleaded guilty to 6 felonies. November 21, 1990 - U.S. District Judge Kimba Wood sentenced Michael Milken (former Drexel Burnham junk-bond king) to a ten-year prison term for various securities law infractions (insider trading and "stock manipulation"). 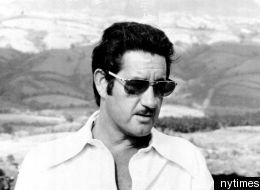 August 26, 1994 - Financier Robert Vesco received a 13-year jail sentence in Cuba for "economic crimes against the state." The Detroit native was found guilty of defrauding Cuba's state-run pharmaceutical agency during the development of TX, a plant-based "wonder drug" that was reputed to help prevent AIDS and cancer. In the early 1970s - he was charged with making illegal contributions to Richard Nixon's reelection campaign for which the government indicted him (rather than serve time, he fled to Latin America). Vesco was also charged with trying to swindle mutual fund investors out of $224 million. December 6, 1994 - Orange County, CA filed for bankruptcy protection due to investment losses of about $2 billion; single biggest bankruptcy filing by a municipality; Orange County officials over-leveraged county's fund, borrowed significantly for securities trading via use of reverse repurchase agreements (investors borrow money to buy securities, put up securities as collateral); fund suffered losses for a year, lenders' risk increased, county forced to put up more collateral; fund's losses rose to about $2 billion, county officials filed for Chapter 9 bankruptcy. February 26, 1995 - Barings PLC, Britain's oldest investment banking firm, collapsed after one of its Singapore-based securities traders (Nick Leeson) lost more than $1.4 billion by gambling on Tokyo stock prices; March 2, 1995 - British trader Nick Leeson arrested. September 26, 1995 - Japan's 12th-largest institution, Daiwa Bank, admitted that lax regulatory controls at a branch in New York had led to a loss of more than $1 billion over an 11-year period; trader Iguchi Toshihide blamed; Daiwa, Japanese bureaucrats accused of cover-up; November 2, 1995 - Daiwa Bank's American operations closed after an investigation revealed: 1) it had let Toshihide continue to make unauthorized deals, even after he had racked up $1.1 billion in debt on bad trades; 2) had worked with trader to cover up losses. March 7, 1997 - Federal Judge Robert Sweet sentenced Steven Hoffenberg, former chief of Towers Financial Corp., to a twenty-year prison term, to pay out $462 million in restitution, $1 million in fines; accused of pawning off vast sums of "worthless" Tower-backed bonds to unsuspecting investors, conned investors out of $500 million to fund extravagant habits. October 31, 2002 - The Securities and Exchange Commission ordered investigation into allegations that Chairman Harvey Pitt had concealed information on corporate ties of William Webster, his choice to head new accounting oversight board. November 5, 2002 - Securities and Exchange Commission Chairman Harvey Pitt resigned under pressure after series of political missteps that had embarrassed White House. 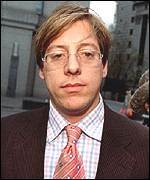 June 10, 2003 - ImClone chief Sam Waksal was sentenced to more than seven years in prison in connection with stock-trading scandal. 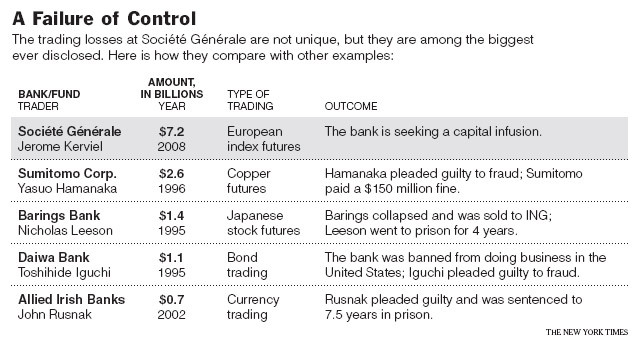 January 24, 2008 - Societe Generale (one of Europe's biggest banks) revealed it had lost $7.15 billion dollars at hands of a rogue trader (Jerome Kerviel, 31); January 26, 2008 - surrendered to the police in Paris. (Allied Irish Banks Limited), Siobhán Creaton and Conor O'Clery (2002). Panic at the Bank: How John Rusnak Lost AIB $691,000,000. (Dublin, IR: Gill & Macmillan, 181 p.). Rusnak, John; Allied Irish Banks plc. ; Allfirst Bank; Floor traders (Finance)--United States--Biography; Bank fraud--United States. (Barings), Judith H. Rawnsley (1995). Total Risk: Nick Leeson and the Fall of Barings Bank. (New York, NY: HarperBusiness, 206 p.). Leeson, Nicholas William; Barings Bank; Merchant banks--Great Britain; Bank failures--Great Britain; Derivative securities. (Barings), Nicholas W. Leeson with Edward Whitley (1996). Rogue Trader: How I Brought Down Barings Bank and Shook the Financial World. (Boston, MA: Little, Brown, 273 p.). Barings Bank; Merchant banks--Great Britain; Bank failures--Great Britain; Fraud investigation; Stockbrokers--Biography. (Barings), John Gapper and Nicholas Denton (1996). All That Glitters: The Fall of Barings. (London, UK: Hamish Hamilton, 364 p.). Leeson, Nicholas William; Barings Bank; Merchant banks -- Great Britain; Bank failures -- Great Britain; Derivative securities. (Barings), Stephen Fay (1996). The Collapse of Barings. (London, UK: Richard Cohen Books, 308 p.). Barings Bank; Bank failures -- Great Britain. (Bell & Beckwith), Homer Brickley, Jr. (1985). Master Manipulator. (New York, NY: American Management Association, 161 p.). Bell & Beckwith; Securities fraud -- Ohio -- Toledo -- Case studies; Brokers -- Malpractice -- Ohio -- Toledo -- Case studies; White collar crime investigation -- Ohio -- Toledo -- Case studies. (Bennett Companies), Stewart L. Weisman (1999). Need and Greed: The Story of the Largest Ponzi Scheme in American History. (Syracuse, NY: Syracuse University Press, 377 p.). Bennett, Patrick; Bennett, Michael A.; Bennett Companies; Commercial crimes -- United States -- Case studies; Commercial crimes -- New York (State) -- Syracuse -- Case studies; Securities fraud -- United States -- Case studies; Securities fraud -- New York (State) -- Syracuse -- Case studies. (Daiwa), oshihide Iguchi (2004). My Billion Dollar Education. (Bedford, IN: JoNa Books, 280 p.). Iguchi, Toshihide; Daiwa Securities; Fraud investigation; Stockbrokers--Biography. (Dow Jones), R. Foster Winans (1986). Trading Secrets: Seduction and Scandal at the Wall Street Journal. (New York, NY: St. Martin's Press, 320 p.). Winans, R. Foster; Dow Jones & Co.; Wall Street Journal; Wall Street; Journalists--United States; Securities fraud--New York (State)--New York. (Drexel Burnham), Douglas Frantz (1987). Levine & Co.: Wall Street's Insider Trading Scandal. (New York, NY: Holt, 370 p.). Levine, Dennis, 1952- ; Bankers -- United States -- Biography; Insider trading in securities -- United States; Investment banking -- United States -- Corrupt practices; Investment banking -- Corrupt practices -- United States. (Drexel Burnham), Dennis B. Levine, with William Hoffer (1991). Inside Out: An Insider's Account of Wall Street. (New York, NY: Putnam, 431 p.). Levine, Dennis, 1952- ; Insider trading in securities -- United States; Investment banking -- United States -- Corrupt practices; Investment banking -- Corrupt practices -- United States. (Drexel Burnham), Benjamin Stein (1992). A License to Steal: The Untold Story of Michael Milken and the Conspiracy to Bilk the Nation. (New York, NY: Simon & Schuster, 219 p.). Milken, Michael; Drexel Burnham Lambert Incorporated; Stockbrokers--United States--Biography; Junk bonds--United States; Securities industry--Corrupt practices--United States. (Drexel Burnham), Mary Zey (1993). Banking on Fraud: Drexel, Junk Bonds, and Buyouts. (New York, NY: Aldine de Gruyter, 306 p.). Milken, Michael; Drexel Burnham Lambert Incorporated; Securities industry--Corrupt practices--United States; Junk bonds--United States. (Drexel Burnham), Daniel R. Fischel (1995). Payback: The Conspiracy to Destroy Michael Milken and His Financial Revolution. (New York, NY: HarperBusiness, 332 p.). Professor of Corporate Law (University of Chicago). Milken, Michael; Drexel Burnham Lambert Incorporated; Junk bonds--United States; Insider trading in securities--United States. (Equitable Life Assurance Company), Patricia Beard (2003). After the Ball: Gilded Age Secrets, Boardroom Betrayals, and the Party That Ignited the Great Wall Street Scandal of 1905. (New York, NY: HarperCollins, 402 p.). Former Writer/Editor (Town & Country/Elle). Hyde, James Hazen, 1876-1959; Equitable Life Insurance Company--History; Businessmen--United States--Biography; Wall Street--History. (Equity Funding), Raymond L. Dirks and Leonard Gross (1974). The Great Wall Street Scandal. (New York, NY: McGraw-Hill, 295 p.). Equity Funding Corporation of America; Fraud--United States; Stock exchanges--United States. (Equity Funding), Ronald L. Soble and Robert E. Dallos (1975). The Impossible Dream: The Equity Funding Story, the Fraud of the Century. (New York, NY: Putnam, 313 p.). Equity Funding Corporation of America; Fraud--United States; Stock exchanges--United States. (Equity Funding), [edited by] Lee J. Seidler, Frederick Andrews, Marc J. Epstein (1977). The Equity Funding Papers: The Anatomy of a Fraud. (Santa Barbara, CA: Wiley, 578 p.). Equity Funding Corporation of America; Securities fraud--United States. (Fisk), Willoughy Jones (1872). The Life of James Fisk, Jr. ... Including the Great Frauds of the Tammany Ring ... (Philadelphia, PA: Union Pub. Co., 512 p.). Fisk, James, 1835-1872; Tammany Hall; Businessmen--United States--Biography. (Fisk), Marshall P. Stafford (1871). A Life of James Fisk, Jr.: Being a Full and Accurate Narrative of All the Enterprises in Which He Has Been Engaged. (New York, NY: Pohlemus & Pearson, Printers, 311 p.). Fisk, James, 1835-1872; Businessmen--United States--Biography. (Fisk), Robert H. Fuller (1928). Jubilee Jim: The Life of Colonel James Fisk, Jr. (New York, NY: Macmillan, 566 p.). Fisk, James, 1835-1872. Erie Railroad stock manipulator. (Fisk), W.A. Swanberg (1959). Jim Fisk; The Career of an Improbable Rascal. (New York, NY: Scribner, 310 p.). Fisk, James, 1835-1872. Erie Railroad stock manipulator. (Frankel), J.A. Johnson, Jr. (2000). Thief: The Bizarre Story of Fugitive Financier Martin Frankel. (New York, NY: Lebhar-Friedman Books, 202 p.). Frankel, Martin;. Embezzlement--United States. (Frankel), Ellen Joan Pollock (2002). 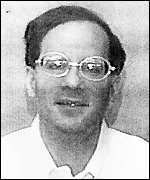 The Pretender: How Martin Frankel Fooled the Financial World and Led the Feds on One of the Most Publicized Manhunts in History. (New York, NY: Simon & Schuster, 276 p.). Frankel, Martin; Embezzlement--United States. (Home-Stake Oil), David McClintick (1977). Stealing from the Rich: The Home-Stake Oil Swindle. (New York, NY: M. Evans, 335 p.). Home-Stake Production Company; Securities fraud -- United States -- Case studies; Petroleum industry and trade -- United States. (IEQ Plc), David Alexander (2004). Crooked Knight: How It All Went Wrong for IEQ. (New York, NY: Origin of Book, 200 p.). Intermediate Equity Plc; fraud. (IOS), Bert Cantor (1970). The Bernie Cornfeld Story. (New York, NY: Lyle Styuart, 320 p.). Cornfeld, Bernie, 1927-; Investors Overseas Services. (IOS), Charles Raw, Bruce Page and Godfrey Hodgson (1971). "Do You Sincerely Want to be Rich?" The Full Story of Bernard Cornfeld and IOS. (New York, NY: Viking Press, 400 p.). Cornfeld, Bernie, 1927- ; Investors Overseas Services; Mutual funds; Swindlers and swindling--Biography; Commercial crimes--Case studies. (IOS), Robert A. Hutchison (1974). Vesco. (New York, NY: Praeger, 376 p.). Vesco, Robert. (IOS), Arthur Herzog (1987). Vesco: From Wall Street to Castro's Cuba: The Rise, Fall, and Exile of the King of White Collar Crime. (New York, NY: Doubleday, 380 p.). Vesco, Robert; Commercial criminals--United States--Biography; White collar crimes--United States. (Julian Petroleum), Jules Tygiel (1996). The Great Los Angeles Swindle: Oil, Stocks, and Scandal During the Roaring Twenties. (Berkeley, CA: University of California Press, 398 p. [orig. pub. 1994]). Julian Petroleum Corporation; Julian Petroleum Corporation; Petroleum industry and trade--Corrupt practices--California--Los Angeles. (Kidder Peabody), Joseph Jett with Sabra Chartrand (1999). Black and White on Wall Street: The Untold Story of the Man Wrongly Accused of Bringing Down Kidder Peabody. (New York, NY: Morrow, 387 p.). Government Bond Trader at Kidder, Peabody. Jett, Joseph; Kidder, Peabody & Co.--Employees--Biography; Insider trading in securities--United States; Securities industry--Corrupt practices--United States. (Kreuger & Toll), Earl Sparling (1932). Kreuger's Billion Dollar Bubble. (New York, NY: Greenberg, 276 p.). Kreuger, Ivar, 1880-1932; Kreuger & Toll. (Kreuger & Toll), William H. Stoneman (1932). The Life and Death of Ivar Kreuger. (Indianapolis, IN: Bobbs-Merrill, 280 p.). Kreuger, Ivar, 1880-1932. (Kreuger & Toll), Manfred Georg; translated from the German by L.M. Sieveking and Ian F.D. Morrow (1933). The Case of Ivar Kreuger; An Adventure in Finance. (London, UK: J. Cape, 256 p.). Kreuger, Ivar, 1880-1932. (Kreuger & Toll), Allen Churchill (1957). The Incredible Ivar Kreuger. (New York, NY: Rinehart, 301 p.). Kreuger, Ivar, 1880-1932. (Krueger & Toll), Bjorn Gafvert (1979). Kreuger, Riksbanken och Regeringen - [Kreuger, Sveriges Riksbank and the Swedish government]. (Stockholm, Sweden: LiberForlag, 340 p.). Kreuger, Ivar, 1880-1932; Sveriges riksbank; Kreuger & Toll; Banks and banking --Sweden; Match industry --Sweden; International finance; Sweden --Politics and government --1905-1950. (Kreuger & Toll), Robedrt Shaplen (1986). Kreuger, Genius and Swindler. (New York, NY: Garland, 251 p. (orig. pub. 1960)). 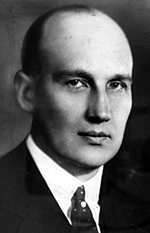 Kreuger, Ivar, 1880-1932; Svenska tändsticks AB--History; Kreuger & Toll--History; Sveriges riksbank--History; Commercial criminals--Sweden--Biography; Swindlers and swindling--Sweden--Biography; International finance--Corrupt practices--History; Match industry--History. (Krueger & Toll), Lars-Jonas Angstrom (1990). Darfor Mordades Ivar Kreuger [The Murder of Ivar Krueger]. (Stockholm, Sweden: Sellin & Blomquist i samarbete med Den Svenska Marknaden, 373 p.). Kreuger, Ivar, 1880-1932; Svenska tandsticks AB --Biography; Kreuger & Toll --History; Sveriges riksbank --History; Commercial criminals --Sweden --Biography; Match industry --Sweden --History; International finance --Corrupt practices --History. (Krueger & Toll), Frank Partnoy (2009). The Match King: Ivar Kreuger, The Financial Genius Behind a Century of Wall Street Scandals. (New York, NY ,: Public Affairs, 288 p.). Former investment banker (Morgan Stanley), corporate lawyer. Kreuger, Ivar, 1880-1932; Svenska tändsticks AB--History; Kreuger & Toll--History; Sveriges riksbank--History; Commercial criminals--Sweden--Biography; Swindlers and swindling--Sweden--Biography; International finance--Corrupt practices--History; Match industry--History. Wisdom of crowds, invisible hand, free and unfettered market; Swedish emigre, Ivar Kreuger, made fortune at height of roaring 20s; raised money in America, made loans in Europe in exchange for matchstick monopolies; 1932 - committed suicide; had turned to shell companies in tax havens, fudged accounting figures, off-balance-sheet accounting, forgery; created raft of innovative financial products; millions went bankrupt when his Wall Street empire collapsed. (Madoff), Erin Arvedlund (2009). Madoff: The Man Who Stole $65 Billion. (New York, NY: Penguin, 320 p.). Madoff, Bernard L.; Swindlers and swindling --United States --Biography; Ponzi schemes --United States; Commercial crimes --United States. (Madoff), Andrew Kirtzman (2009). Betrayal: The Life and Lies of Bernie Madoff. (New York, NY: Harper, 320 p.). Madoff, Bernard L.; Swindlers and swindling --United States --Biography; Ponzi schemes --United States; Commercial crimes --United States. (Madoff), Adam LeBor (2009). The Believers: How America Fell for Bernard Madoff’s $65 Billion Investment Scam. (London, UK: Weidenfeld & Nicolson, 312 p.). Madoff, Bernard L.; Swindlers and swindling --United States --Biography; Ponzi schemes --United States; Commercial crimes --United States. Madoff's connection to, catastrophic impact on, American Jewish community; clubbish world where Madoff operated, links from Palm Beach, Hamptons to salons, clubs of Manhattan society; network of relationships; how despite material success and acclaim, some human impulses remain eternal; how underlying sense of insecurity shapes some of richest, most successful individuals in America, makes them crave ever more status, peer acclaim. (Madoff), Deborah and Gerald Strober (2009). Catastrophe: The Story of Bernard L. Madoff, The Man Who Swindled the World. (Beverly Hills, CA: Phoenix Books, 256 p.). Madoff, Bernard; Ponzi schemes--United States--History; Scandal--Wall Street--history; crime--white collar--history. December 2008 - FBI arrested Bernard Madoff, respected fund manager, former chairman of NASDAQ, for reportedly bilking thousands of trusting investors out of $50 billion; story behind upstanding façade; how he developed elaborate deceit, how and why he targeted, scammed world of Jewish philanthropy; used easy-going charm, country-club sociability to gain entry into influential circles; how he seduced, persuaded sophisticated investors, how he eluded SEC watchdogs for years, how far-reaching crime has affected world. (Madoff), Harry Markopolos (2010). No One Would Listen: A True Financial Thriller. (Hoboken, NJ, Wiley, 376 p.). Former Securities Industry Executive Turned Independent Financial Fraud Investigator. Madoff, Bernard L.; Ponzi schemes --United States. How Markopolos and his team, "The Fox Hounds" (Frank Casey, Neil Chelo, Michael Ocrant), uncovered (in 1998) what Madoff was doing years before financial disaster; no one listened, until damage of world's largest financial fraud ($65 billiobn) was irreversible; how they discovered fraud, how they provided credible, detailed evidence to major newspapers, Securities and Exchange Commission (SEC) many times between 2000 and 2008 (warnings ignored repeatedly by SEC); how SEC missed red flags raised by Markopolos; how Madoff was enabled by investors, fiduciaries alike. (Madoff), Diana B. Henriques (2011). 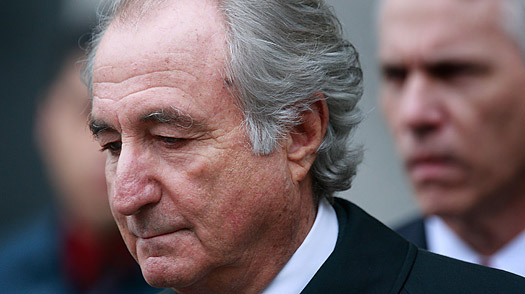 The Wizard of Lies: Bernie Madoff and the Death of Trust. (New York, NY: Times Books, 448 p.). Reporter (New York Times). Madoff, Bernard L.; Swindlers and swindling --United States --Biography; Ponzi schemes --United States; Commercial crimes --United States. Biggest Ponzi scheme in history - swindled friends, relatives, investors out of $65 billion through fraud that lasted for decades; Madoff's remarkable rise on Wall Street (became one of country’s most trusted, respected traders); accelerating slide toward self-destruction; personal disasters, landmark legal battles triggered by Madoff’s downfall (suicides, business failures, fractured families, shuttered charities). (Merrill Lynch), Daniel Reingold with Jennifer Reingold (2006). Confessions of a Wall Street Analyst: A True Story of Inside Information and Corruption in the Stock Market. (New York, NY: Collins, 368 p.). Formerly World's #1 Rated Telecom Analyst at Merrill Lynch. Investment advisors--Corrupt practices--United States; Securities industry--Corrupt practices--United States; Insider trading in securities--United States; Telecommunication--Corrupt practices. How deeply corrupted Wall Street, and much of corporate America, had become during stock market bubble of 1990s. (Morgan Guaranty Trust), Gerald Astor (1975). Hot Paper. (New York, NY: Saturday Review Press, 212 p.). Morgan Guaranty Trust Company of New York; Securities theft--New York (State)--New York--Case studies. Theft of $13 million in negotiable securities. (Nomura), John E Fitzgibbon (1991). Deceitful Practices: Nomura Securities and the Japanese Invasion of Wall Street. (New York, NY: Carol Pub. Group, 222 p.). Nomura Shoken Kabushiki Kaisha --Corrupt practices; United States; Securities and Exchange Commission; Securities industry --Corrupt practices --Japan; Securities --United States. (Orange County), Philippe Jorion, with the assistance of Robert Roper (1995). Big Bets Gone Bad: Derivatives and Bankruptcy in Orange County. (San Diego, CA: Academic Press, 176 p.). Only Professor in Orange County who teaches and researches derivatives. Citron, Robert L.; Investment of public funds--California--Orange County; Derivative securities; Debts, Public--California--Orange County; Municipal bankruptcy--California--Orange County. (Orange County), Mark Baldassare (1998). When Government Fails: The Orange County Bankruptcy. (Berkeley, CA: University of California, 317 p.). Senior Fellow at the Public Policy Institute of California (PPIC) and Professor and Chair of Urban and Regional Planning at the University of California, Irvine. Citron, Robert L.; Investment of public funds--California--Orange County; Derivative securities; Debts, Public--California--Orange County; Municipal bankruptcy--California--Orange County. (Overend and Gurney), Geoffrey Elliott (2006). The Mystery of Overend and Gurney: Financial Scandal in Victorian London. (London, UK: Methuen, 288 p.). Honorary Fellow of St Anthony's College, Oxford. Overend and Gurney; Speculation--Case studies; Financial crises. May 1866 - Overend and Gurney, the City of London's leading discount house - with a turnover second only to that of the Bank of England - suspended all payments and provoked a 'panic without parallel in the financial history of England'. (Ponzi), Donald H. Dunn (1975). Ponzi! : The Boston Swindler. (New York, NY: McGraw-Hill, 254 p.). Ponzi, Charles. (Ponzi), Mitchell Zuckhoff (2005). Ponzi's Scheme: The True Story of a Financial Legend. (New York, NY: Random House, 390 p.). Professor of Journalism (Boston University). Ponzi, Charles; Swindlers and swindling--Biography; Swindlers and swindling--United States--Biography; Ponzi schemes--United States--History; Commercial crimes--United States--Case studies. (Prudential-Bache, Jeffrey Taylor (1994). The Pru-Bache Murder: The Fast Life and Grisly Death of a Millionaire Stockbroker. (New York, NY: HarperCollins, 293 p,). Prozumenshikov, Michael, 1953-1991; Prudential-Bache Securities, Inc.--Case studies; Murder--Minnesota--Minneapolis--Case studies; Stockbrokers--Malpractice--Minnesota--Minneapolis--Case studies. (Prudential-Bache), Kurt Eichenwald (1995). Serpent on the Rock. (New York, NY: HarperBusiness, 480 p.). Reporter-New York Times. Prudential-Bache Securities, Inc., Securities Fraud. (Prudential-Bache), Kathleen Sharp (1995). In Good Faith. (New York, NY: St. Martin's Press, 256 p.). Prudential-Bache Securities, Inc.--Corrupt practices; Securities fraud--United States--Case studies. (Quintex Group), Tom Prior (1994). Christopher Skase: Beyond the Mirage. (Melbourne, Vic. : Wilkinson Books, 247 p.). 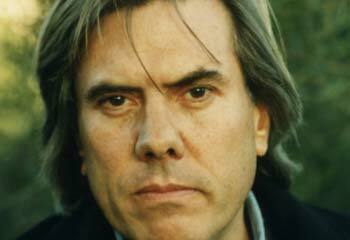 Skase, Christopher; Businesspeople--Australia--Biography. (Quintex Group), Lawrence van der Plaat (1996). Too Good To Be True: Inside the Corrupt World of Christopher Skase. (Sydney, AU: Macmillan, 388 p.). Skase, Christopher; Businesspeople--Australia--Biography; Directors of corporations--Australia--Biography; Fugitives from justice--Australia--Biography. (Rich), A. Craig Copetas (1985). Metal Men: Marc Rich and the 10-Billion-Dollar Scam. (New York, NY: Putnam, 224 p.). Rich, Marc; Metal trade; Brokers; Tax evasion--United States. (Salomon Brothers), Martin Mayer (1993). Nightmare on Wall Street: Salomon Brothers and the Corruption of the Marketplace. (New York, NY: Simon & Schuster, 272 p.). Salomon Brothers; Government securities--Marketing--Corrupt practices--United States. (Slater Walker Securities), Charles Raw (1977). A Financial Phenomenon: An Investigation of the Rise and Fall of the Slater Walker Empire. (New York, NY: Harper & Row, 368 p.). Slater, Jim, 1929- ; Walker, Peter Edward, 1932- ; Slater, Walker Securities, Ltd.; Capitalists and financiers--Great Britain--Biography. (Slater Walker Securities), Jim Slater (1977). Return to Go: My Autobiography. (London, UK: Weidenfeld and Nicolson, 278 p.). Slater, Jim, 1929- ; Slater, Walker Securities Ltd.; Capitalists and financiers--Great Britain--Biography. (Texas Gulf Sulphur), Morton Shulman (1970). The Billion Dollar Windfall. (New York, NY: Morrow, 239 p.). Texas Gulf Sulphur Company, inc.; Minority stockholders; Stocks--Prices. (TexasGulf Sulphur), Kenneth G. Patrick (1972). Perpetual Jeopardy: The Texas Gulf Sulphur Affair; a Chronicle of Achievement and Misadventure. (New York, NY: Macmillan, 363 p.). Texas Gulf Sulphur Company, inc.; Securities--United States. (Tipperary Joint- Stock Bank), James O'Shea (1999). 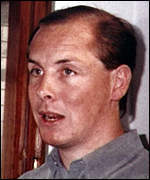 Prince of Swindlers John Sadleir, M.P. 1813-1856. (Dublin, IR: Geography Publications, 510 p.). Sadleir, John, 1813-1856; Swindlers and swindling --Ireland --Biography; Legislators --Ireland --Biography. Ireland --Politics and government --1837-1901; Tipperary (Ireland : County) --Biography. February 16, 1856 - British member of parliament (42), newspaper publisher, bank and railroad chairman, committed suicide; his fraud wiped out at least three companies, caused ruin, misery, disgrace to thousands; forged property deeds to secure mortgages embezzled money from banks he chaired, concealed balance sheets with false statements. (ZZZ Best), Joe Domanick (1989). Faking It in America: Barry Minkow and the Great ZZZZ Best Scam. (Chicago, IL: Contemporary Books, 288 p.). Minkow, Barry; Swindlers and swindling--California--Case studies; Corporations--Corrupt practices--California--Case studies; Success in business--California--Case studies; Swindlers and swindling--California--Biography. (ZZZ Best), Daniel Akst (1990). Wonder Boy: Barry Minkow, the Kid Who Swindled Wall Street. (New York, NY: Scribner's, 280 p.). Minkow, Barry; Businesspeople--United States--Biography; Success in business--United States; Fraud--United States; Wall Street. (ZZZ Best), Barry Minkow (1995). Clean Sweep: The Inside Story of the ZZZZ Best Scam--One of Wall Street's Biggest Scams. (Nashville, TN: Nelson Publishers, 244 p.). Founder of ZZZ Best Co., Perpetrator of Fraud. Minkow, Barry; Businesspeople--United States--Biography; Christian converts--United States--Biography; Success in business--United States; Fraud--United States; Wall Street. (ZZZ Best), Barry Minkow (2005). Cleaning Up: One Man's Redemptive Journey Through the Seductive World of Corporate Crime. (Nashville, TN: Nelson Current, 330 p.). 7 Years in Jail for Securities Fraud. Minkow, Barry; Businessmen--United States--Biography; Swindlers and swindling--United States--Biography; Christian converts--United States--Biography; Fraud--United States. Robert Smith Bader (1982). The Great Kansas Bond Scandal. (Lawrence, KS: University Press of Kansas, 392 p.). Securities fraud -- Kansas; Kansas -- History -- 20th century. Donald C. Bauder (1985). Captain Money and the Golden Girl: the J. David Affair. (San Diego, CA: Harcourt Brace Jovanovich, 244 p.). Dominelli, J. David; Hoover, Nancy; Securities fraud -- California, Southern; Swindlers and swindling -- California, Southern. Alex Berenson (2003). The Number: How the Drive for Quarterly Earnings Corrupted Wall Street and Corporate America. (New York, NY: Random House, 274 p.). Business Reporter (New York Times). Corporations--Accounting--Corrupt practices--United States; Corporations--Accounting--Corrupt practices--United States--Prevention; Financial statements--United States--Auditing. David Morier Evans (1968). Facts, Failures & Frauds; Revelations, Financial, Mercantile, Criminal. (New York, NY: A. M. Kelley, 727 p. [orig. pub. 1859]). Corporations--Great Britain--Finance--Case studies; Fraud--Great Britain--Case studies; Speculation--Case studies. Ken Fisher, Lara W. Hoffmans (2009). How to Smell a Rat: The Five Signs of Financial Fraud. (Hoboken, NJ: Wiley, 207 p.). Founder, Chairman, and CEO of Fisher Investments, 'Portfolio Strategy' Columnist (Forbes magazine); Content Manager at Fisher Investments. Fraud --Prevention; Commercial crimes; Investments; Swindlers and swindling. Fraudsters often follow same basic playbook; learn playbook, ask right questions - financial fraud easy to detect, simple to avoid; ways to identify both intended, possible future fraud; quick, identifiable features, red flags of potential financial frauds; red flags. William Flynn (1992). Gibgate: The Untold Story. (Dublin, IR: Celtic Pub., 204 p.). Ross, George Finbarr, 1945- ; International Investments Limited -- Corrupt practices; Securities industry -- Corrupt practices -- Ireland; Securities fraud -- Ireland; Stockbrokers -- Ireland -- Biography. Diane Francis (1988). Contrepreneurs. (Toronto, ON: Macmillan, 310 p.). Securities fraud -- Canada; Money laundering -- Canada; White collar crimes -- Canada. Leslie Gould (1966). The Manipulators. (New York, NY: D. McKay Co., 276 p.). Speculation; Stocks; Swindlers and swindling. Ed. Samuel L. III Hayes (1987). Wall Street and Regulation. (Boston, MA: Harvard Business School Press, 206 p.). Professor of Investment Banking (Harvard Business School). Banking law -- United States; Investments -- Law and legislation -- United States. Michael Hellerman with Thomas C. Renner (1977). Wall Street Swindler. (Garden City, NY: Doubleday, 367 p.). Hellerman, Michael; Swindlers and swindling -- United States -- Biography; Securities theft -- United States; White collar crimes -- United States. Sam Jaffa (1998). Safe as Houses: The Schemers and Scams Behind Some of the World's Greatest Financial Scandals. (New York, NY: Robson Books, 317 p. [orig. pub. 1997]). White collar crimes--History; Commercial crimes--History. Lawrence Lever (1992). The Barlow Clowes Affair. (London, UK: Macmillan, 278 p.). Clowes, Peter; Barlow Clowes (Firm); Securities fraud -- Great Britain. Henry G. Manne (1966). Insider Trading and the Stock Market. (New York, NY: Free Press, 274 p.). Securities--United States. Gene G. Marcial (1995). Secrets of the Street: The Dark Side of Making Money. (New York, NY: McGraw-Hill, 238 p.). Wall Street; Insider trading in securities -- United States. Martin Mayer (1992). Stealing the Market: How the Giant Brokerage Firms, with Help from the SEC, Stole the Stock Market from Investors. (New York, NY: Basic Books, 208 p.). Stockbrokers--Corrupt practices--United States; Securities industry--Corrupt practices--United States; Stock exchanges--Corrupt practices--United States; Securities fraud--United States. Joe McGinniss (2007). Never Enough. (New York, NY: Simon & Schuster, 358 p.). Kissel, Nancy; Kissel, Rob, d. 2003; Murder--China--Hong Kong--Case studies; Homicide--China--Hong Kong--Case studies; Americans--China--Hong Kong. November 2003 - Nancy Kissel (39, three young children) 'had it all'; charged with killing her husband, Merrill Lynch and former Goldman Sachs investment banker Robert Kissel, in bedroom of their luxury apartment above Hong Kong's Victoria Harbour; 2006 - Andrew Kissel (brother), Connecticut real estate tycoon facing prison for fraud, embezzlement, found dead, stabbed in back in basement of his multimillion-dollar Greenwich, CT mansion; assailant unknown. Frank Portnoy (2003). Infectious Greed: How Deceit and Risk Corrupted the Financial Markets. (New York, NY: Times Books, 465 p.). Former Derivatives Salesman at Morgan, Stanley. Securities fraud--United States; Financial services industry--Corrupt practices--United States; Corporations--United States--Corrupt practices; Corporations--Auditing--United States; Fraud--United States--Prevention. John Lawrence Reynolds (2001). Free Rider: How a Bay Street Kid Stole and Spent $20 Million. (Toronto, ON: McArthur & Co., 456 p.). Holoday, Michael; Securities fraud--Canada; Stockbrokers--Canada--Biography; Fraude boursiere--Canada; Courtiers en valeurs mobilieres--Canada--Biographies. Susan P. Shapiro (1984). Wayward Capitalists: Target of the Securities and Exchange Commission. (New Haven, CT: Yale University Press, 227 p.). Senior Research Fellow at the American Bar Foundation. United States. Securities and Exchange Commission; Securities fraud -- United States; White collar crime investigation -- United States. Gene Smith (1962). The Life and Death of Serge Rubinstein. (Garden City, NY: Doubleday, 284 p.). Rubinstein, Serge, 1908-1955. Mark Stevens (1987). The Insiders: The Truth Behind the Scandal Rocking Wall Street. (New York, NY: Putnam, 256 p.). Insider trading in securities--United States; Consolidation and merger of corporations--United States; Investment Banking--United States; Wall Street. James B. Stewart (1991). Den of Thieves. (New York, NY: Simon & Schuster, 493 p.). Insider trading in securities--United States; Investment banking--Corrupt practices--United States. David A. Vise and Steve Coll (1991). Eagle on the Street: Based on the Pulitzer Prize-winning Account of the SEC's Battle with Wall Street. (New York, NY: Scribner, 395 p.). United States. Securities and Exchange Commission--Officials and employees; Securities industry--United States--Corrupt practices; Securities fraud--United States. T. H. Wang; [edited by] Mark Anderson (2001). The Economic Gang: One Man's Battle with Japan, Inc. (Sublimity, OR: Firelight Publishing, Inc., 384 p.). Wang, T. H.; Investments--Japan; Government--Japan. Gary Weiss (2003). Born To Steal: A Life Inside the Wall Street Mafia. (New York, NY: Warner Books, 384 p.). Senior Writer (Business Week). Pasciuto, Louis, 1973- ; Stockbrokers--New York (State)--New York--Biography; Securities fraud--New York (State)--New York; Wall Street; Mafia--New York (State)--New York. --- (2006). Wall Street Versus America: The Rampant Greed and Dishonesty that Imperil Your Portfolio. (New York, NY: Portfolio, 320 p.). Former Reporter (Business Week). New York Stock Exchange; Securities fraud--United States; Securities industry--United States. Wall Street practices enable, encourage corruption, small investor left holding bag. Publications about legal vs. illegal insider trading, the rules on holding restricted stock, and rewards for tips on illegal trading. On the surface, the subject may not seem terribly interesting, but the importance of providing historical materials relating to the growth and development of the Securities and Exchange Commission (SEC) is tremendously important. Since 1999, the Securities and Exchange Commission Historical Society has been collecting materials in this area, and for the past several years it have included many of these materials on this website. On the site, visitors can view a timeline of the SEC's history, peruse (and listen) to a number of oral histories, and view crucial primary documents. The "Online Programs" area is also worth a look, as it contains full broadcasts with experts on such topics as "Developments in the Mutual Fund Industry" and "Transformation of Wall Street". The site is rounded out by a photograph archive, which can be browsed alphabetically.